Space weather: Tornadoes, dust storms, hurricanes, acid rain on other planets and moons. Bizarre weather is not restricted to Earth. Hurricane Sandy was a speck of dust compared to some of the cataclysms currently taking place around the solar system. Jupiter, for example, is going through a tumultuous time right now. The gas giant has suffered more meteor impacts in the past four years than has ever been observed, and large cloud formations are spontaneously changing color or disappearing as quickly as they form. 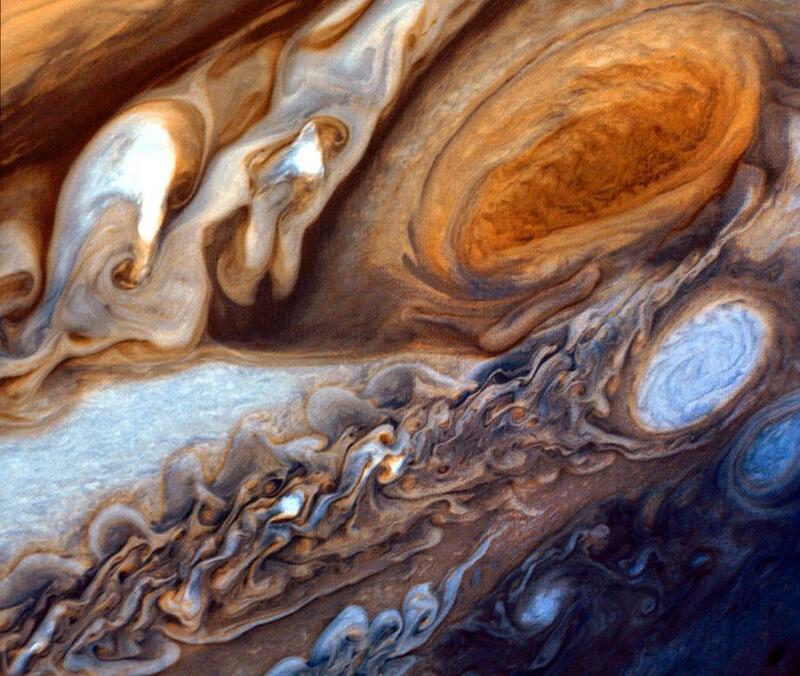 This famous megastorm, dubbed the Great Red Spot, is at least 400 years old and dates back to the time when Galileo first aimed his telescope at Jupiter and its moons in the early 1600s—so for all we know, the storm could be much older than that. Scientists believe the storm might owe its red color to sulfur in the atmosphere, but they remain uncertain about what precisely gives it its crimson hue. In the past couple of years, a new sibling storm has erupted. The Little Red Spot, or Red Spot Jr., formed from the merger of three smaller white-colored storms in Jupiter’s southern hemisphere. NASA/ESA/A. Simon-Miller (Goddard Space Flight Center)/I. de Pater/M. Wong (UC Berkeley). The Little Red Spot, at center in the picture above, has kept growing since it was discovered in 2006 and is now about the size of Earth—and with wind speeds of 400 mph, it is now spinning as fast as its larger predecessor. 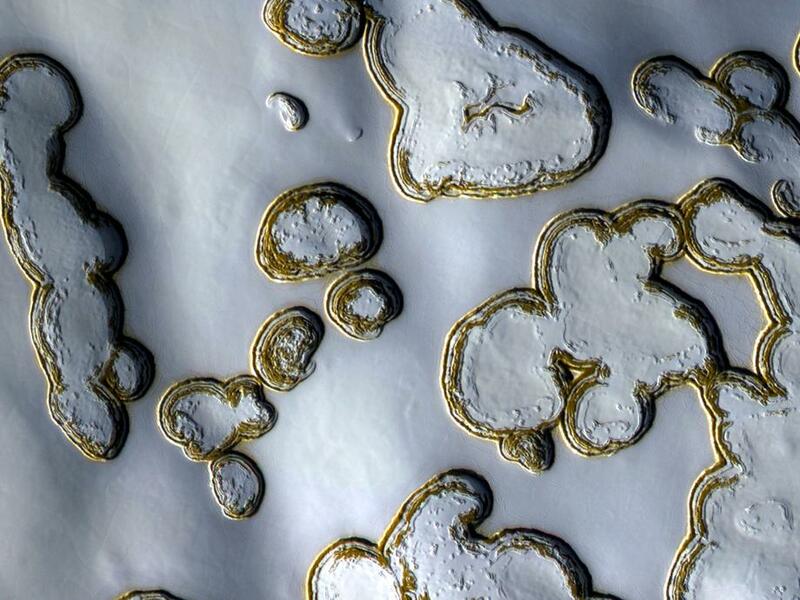 We’ve known for a while there’s water ice on Mars, both on the northern polar ice cap and away from it, but in September, NASA’s Mars Reconnaissance Orbiter detected carbon-dioxide snow clouds and snowfall. It’s the first evidence of this kind of snow anywhere in our solar system. This photograph from July 2011 (toward the end of the Martian summer) shows what happens when warm weather causes a section of the vast carbon-dioxide ice cap to sublimate directly into gas, leaving behind oddly-shaped, seemingly gold-lined pits around the Red Planet’s south pole. 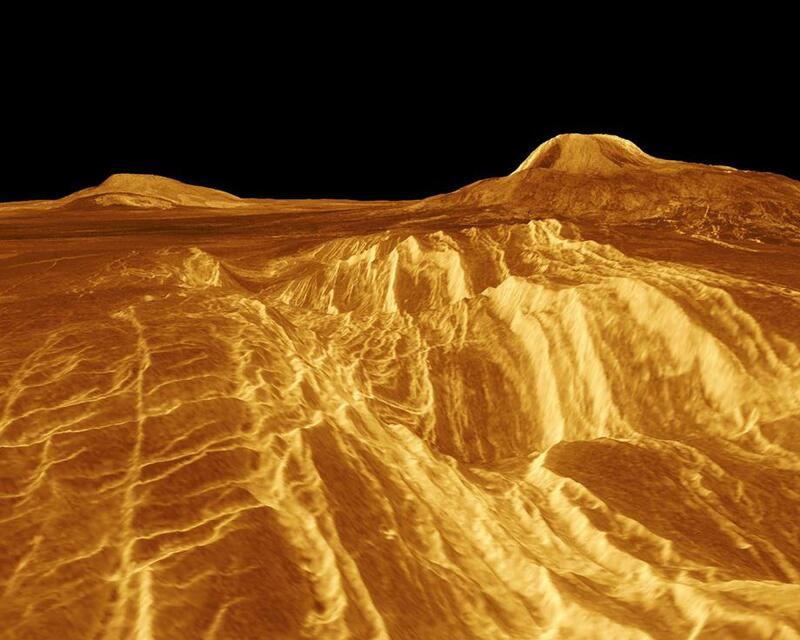 Venus is like Earth on (sulfuric) acid. Its atmosphere is made of dense carbon-dioxide clouds and this extremely corrosive substance, which can explode when water is added. The acid precipitates from clouds, but due to the extreme temperatures, it evaporates before reaching the ground, making for some very short-lived acid rain. 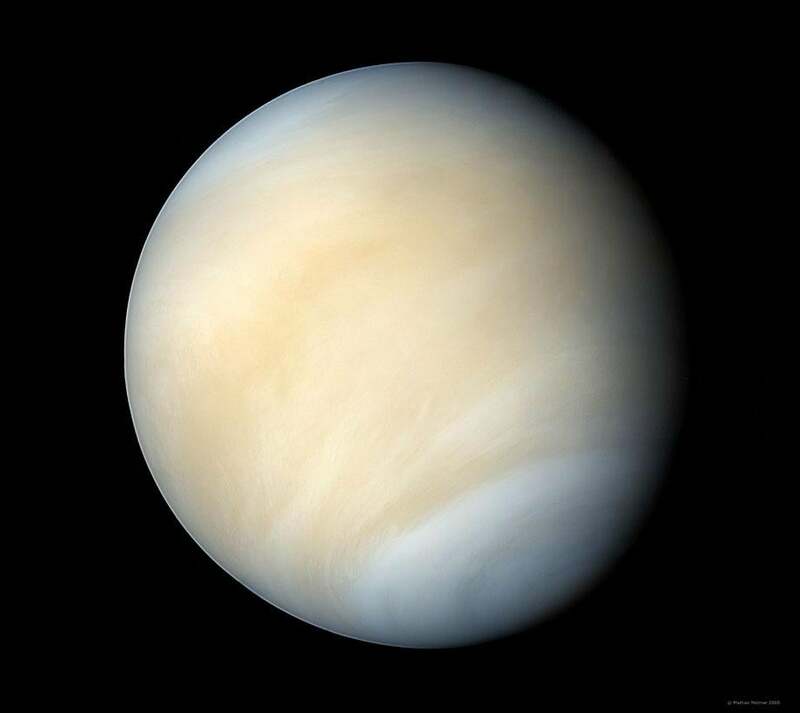 Similar to Earth only in size and shape, Venus was taken over by a runaway greenhouse effect millions of years ago and turned into a hellish nightmare hot enough to melt lead. The planet has scorching temperatures of 860 degrees Fahrenheit or more year-round and a crushing atmosphere with more than 90 times the pressure of Earth’s. It’s no wonder probes that landed on the second planet from the Sun have survived only a few hours before being destroyed. 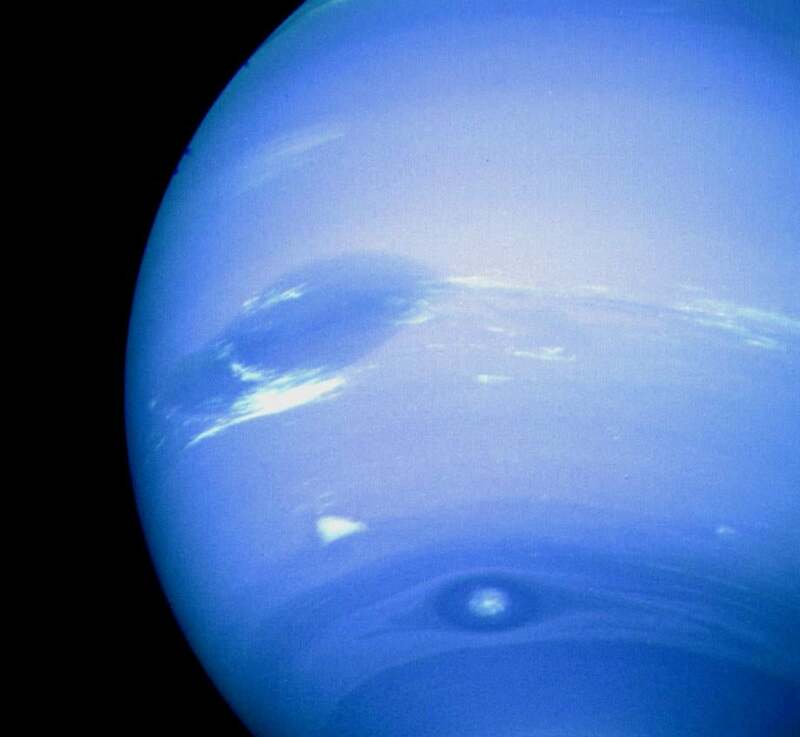 Clouds of frozen methane whirl across Neptune, our solar system’s windiest world, at more than 1,200 mph—similar to the top speed of a U.S. Navy fighter jet. Meanwhile, Earth’s most powerful winds hit a puny 250 mph. Some cloud formations, such as a swift-moving one called “scooter,” circle the planet every 16 hours. Neptune’s top wind layer blows in the opposite direction to the planet’s rotation, which could mean there’s a slushy interior of thick layers of warmer water clouds beneath the methane. 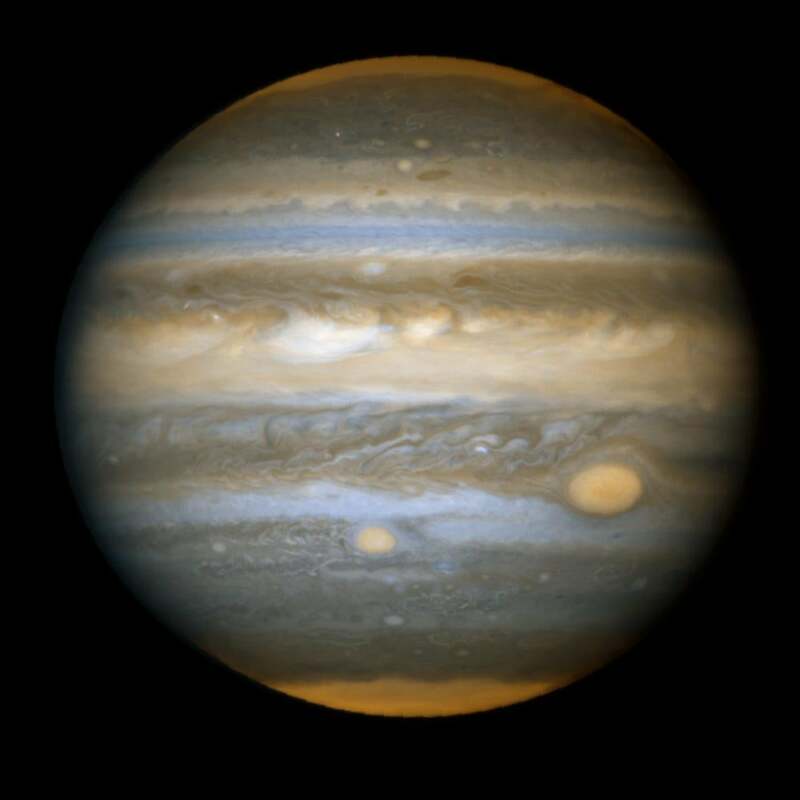 Featured above is the Great Dark Spot, which was believed to be similar to Jupiter’s Great Red Spot—a fast cyclonic storm like a hurricane or typhoon. But the Hubble Space Telescope disproved that when it showed the spot disappearing and reappearing somewhere else in the planet. Scientists then speculated that the megastorm might be a hole in the methane clouds, like our very own, now-shrinking hole in the ozone layer. Because of a dry, rocky, desert-like surface, dust storms are very common on Mars. They can engulf the entire planet, raise the atmospheric temperature by up to 30 degrees Celsius, and last for weeks. The storm pictured above, though huge, lasted less than 24 hours. It spread along the north seasonal polar cap edge in late northern winter in a region called Utopia Planitia. A dust devil about half a mile high swirls over a sandy Martian surface on a late spring afternoon. 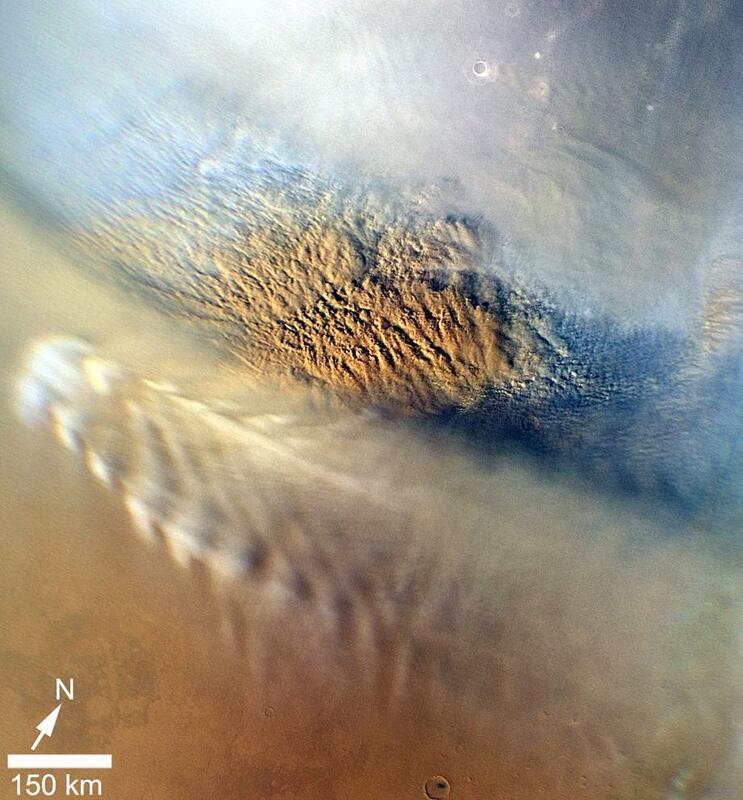 Winds on Mars are powered by solar-heat convection currents, as they are on other planets, including Earth. During spring, when Mars is the farthest from the sun, the planet gets less sunlight, but even then dust devils relentlessly scour the surface and move around freshly deposited dust. 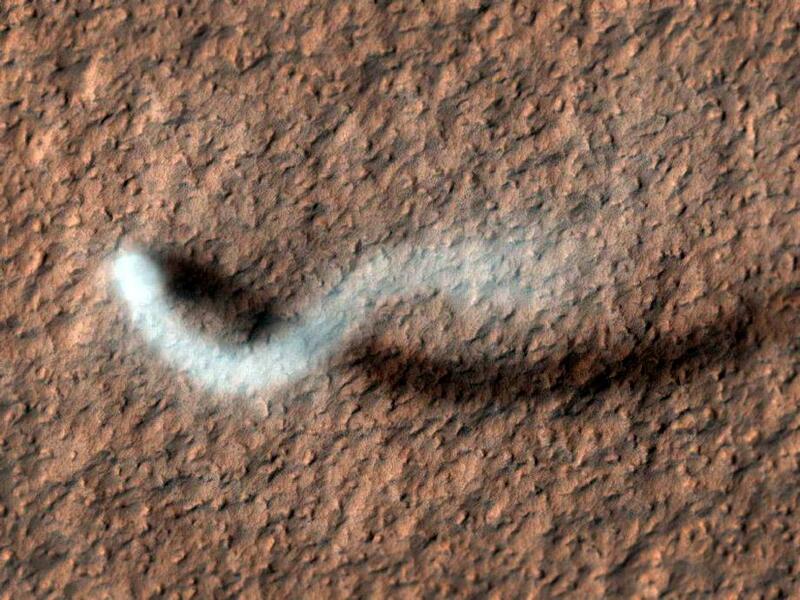 This dust devil, 30 yards wide, was whirling around the Amazonis Planitia region of northern Mars. 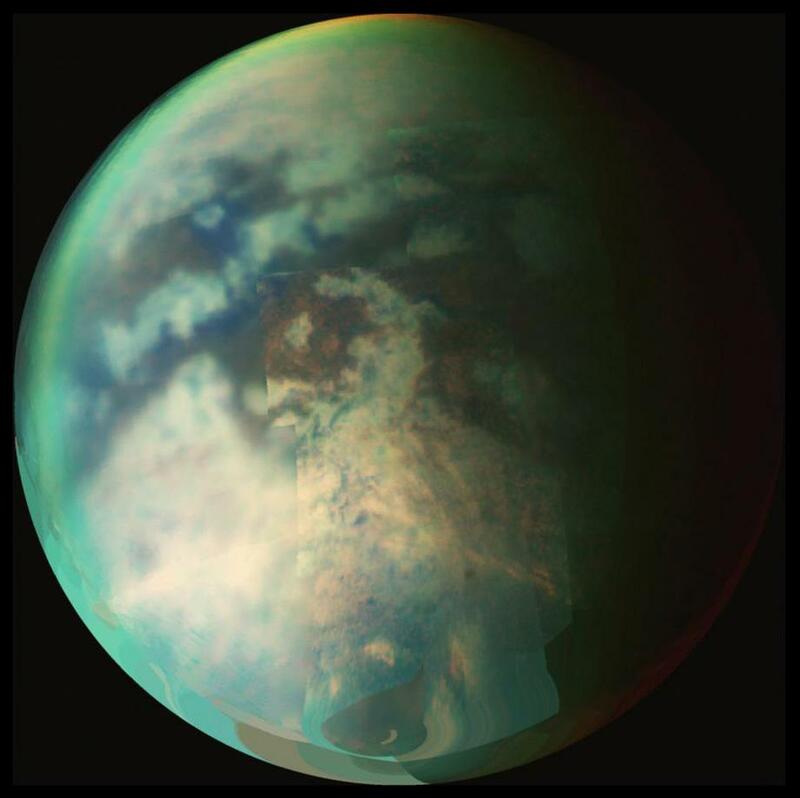 Saturn’s largest moon, Titan, looks a lot like Earth in its cloud cover and terrain. Except this moon’s clouds are made of methane. Titan has a methane cycle that is similar to the Earth’s water cycle. Since methane has a much lower melting point than water (a frosty minus 295.6 F), it fills lakes on the surface of this frigid moon, saturates clouds in the atmosphere, and falls again as rain. This thick atmosphere, in which organic molecules float around freely, could potentially be ripe for life—or brimming with it already. 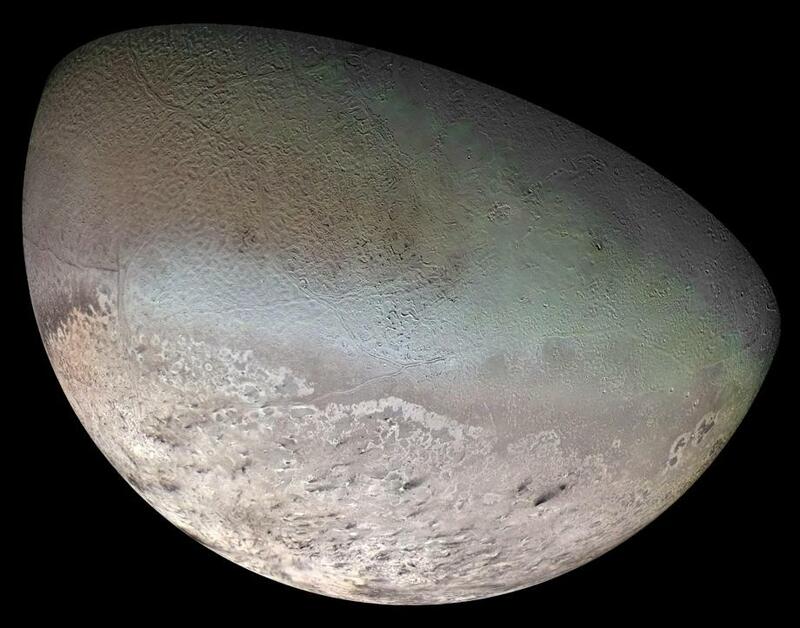 Triton, Neptune’s largest moon, is the coldest place in our solar system. It has an average temperature of minus 315 F. This image, taken by Voyager 2 in August 1989, shows the large, pinkish south polar cap, which may consist of a slowly evaporating layer of nitrogen ice. The nitrogen then forms clouds a few kilometers above the surface. Triton has a weird, backward orbit and has been inching closer to Neptune each year. When the two finally collide, in about 10 million to 100 million years, the moon will be shredded into rings perhaps as beautiful as those of Saturn. 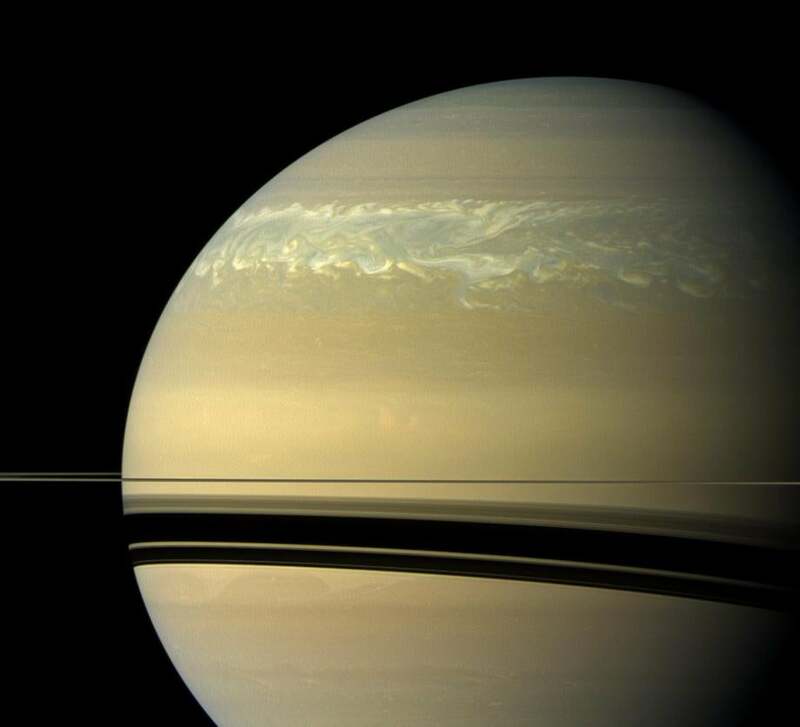 This storm, eight times the surface area of Earth, has been raging since December 2010 on Saturn. NASA’s Cassini spacecraft took this photo during a turbulent spring in northern Saturn. At its most intense, the storm generated more than 10 lightning flashes per second. Climate change is a reality on Earth, and it is severe and undeniable around our solar system. In fact, Venus’s greenhouse effect and, more recently, the vast amount of evidence for running water in Mars’s past are helping scientists understand climate change on our own planet.